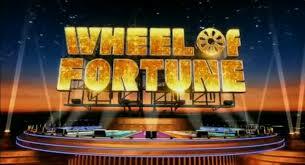 Have you read Part 1 of “How to Be a Wheel of Fortune Contestant”? If you’d like to read this story from the beginning, Part 1 is here. I signed up online for the Wheel of Fortune newsletter to arrive in my email, just because I’m nerdy, and not because I expected it to turn into an actual appearance on the show. 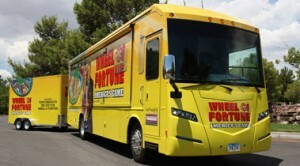 We lived right outside Nashville, TN at the time, and the newsletter popped into my inbox stating that the Wheelmobile would be in Knoxville, TN, a three hour drive, on an upcoming weekend in May. “Why not?” I thought. “Why not me? It has to be somebody, so it could be me!” I gassed up my car on a Sunday morning, skipped church (leaving my husband to fend for our small children), and headed down the interstate. WHAT IS THE WHEELMOBILE? The Wheelmobile is a traveling show that allows thousands of people to try out to be WOF contestants by playing the travel version of WOF in a close-to-home location. The Wheelmobile staff set up in a large Knoxville Farmer’s Market, and when I arrived there were probably 500-600 people in the large atrium. Like a cattle call, hundreds of us stood in line with information cards, filled them out, and dropped them into a barrel. Then, we waited for the fun to begin. A very charismatic actor and actress (fake-Pat and fake-Vanna) hosted the event and gave the crowd instructions on what do to when/if our names were called (more on that later). They had a raised stage and a WOF board except it was filled with 8×10 dry erase white boards. Fake-Vanna wrote correct letters onto the white boards. DESCRIBE HOW THE WHEELMOBILE EVENT IS RUN. Fake-Pat announced that we would have three one-hour shows that day, and that they would draw as many names as they could fit into the hour, five names at a time. The large barrel with the information cards was wheeled onto the stage and placed on a spit so it could turn. Microphone in hand, fake-Pat drew out five random names at a time, and the lucky five people went to the stage to try their hand. Five more people whose names were drawn would be waiting in the wings to take the stage after the previous five had gone. While I watched, I would say they kept a pace of roughly 40-45 people/8-9 groups per hour. WHAT HAPPENS ONSTAGE? Those lucky contestants whose names were drawn had two tasks. They played a lightning round of WOF for a puzzle, possibly two puzzles (i.e., guess a letter, have 5 seconds to solve, etc.). The producers ensured that each person of the group of five was allowed to guess letters. After the puzzle was over, each contestant was brought to the front of the stage where fake-Pat briefly interviewed them about themselves, exactly as Pat Sajak does on WOF. Public speaking on an adrenaline high is pretty intense, and the producers are looking for people who are not only guessing logical letters in Hangman but also people who have personality, are likable, memorable, etc. And then, we walked off the stage. A producer ensured that she had everyone’s contact information, and then I left for my long drive home. Be charismatic, even on your information card. If your name isn’t drawn out of the barrel to go onstage, it will still be read by a producer. If you impress them with your writing (be careful with grammar and spelling, y’all! ), they might call you to Round 2 anyway. I met several people at Round 2 who hadn’t been called onstage during Round 1 but were called to Round 2 anyway. If you’re called onstage, your audition begins the moment the cameras (there are cameras set up everywhere!) find you. You should be excited, enthusiastic, and get on up there fast. Smile. You’re one step closer to being on Wheel of Fortune! Amazing! Dress nicely. The well-dressed people who made it onstage appeared more confident and more like the contestants you see on TV, even if they were nervous. You don’t want the producers (or anyone!) to write you off because you look sloppy. Know what you’re going to say when you introduce yourself. It shouldn’t sound like a rehearsed word-for-word speech, but this is your chance, and you want to be well-prepared. Say something about yourself that helps you stand out. I told everyone about being a high school English teacher, and I make a joke. I said I was a “yerd…yearbook + nerd = yerd.” It wasn’t terribly funny, but it stuck with the producers, and they seemed to like it. If your name isn’t drawn out of the barrel, you have to write out a new card for each hour-long show. You don’t want to wait around all day for your name to be called and not have it be in the barrel. All in all, Round 1 with the Wheelmobile staff was fun and exhausting. I would also argue that showing up to a Wheelmobile event drastically increases your chances of being noticed by the producers (rather than sending in a video of yourself). If you follow WOF on Twitter, I think they announce when and where they’ll be next. Maybe they’re coming near you! PS-I didn’t take photos of these early rounds…I can’t remember why! I was either too nervous (and I was by myself), or they didn’t allow it…(?) I can’t remember! PSS-Please remember that my auditions and show were in 2012…they may have tweaked this process a bit since then. Like what you’ve read? You can follow me on Facebook, Twitter, or Instagram to see more of Carrie On Y’all. Thanks! Ok, I am officially out…I don’t think I could even handle this round of the process. I always feel like I am going to pass out if I get in front of people, which probably isn’t what they are looking for! 😉 It would be entertaining, but my puzzle solving abilities would be severely limited by me being in the supine position behind my stand! Haha!